Most people think that the bathroom is the dirtiest room in the house — it does have the toilet, after all. But for years now, experts have been telling us that our kitchens actually harbor more germs and bacteria than any other room in our homes, which actually makes a lot of sense. From food preparation to nasty spills, the kitchen is a high traffic area for germs — but don’t freak out and douse your whole kitchen in bleach. Common cleaning products, like chorine bleach, are full of harsh chemicals that can poison your indoor air and irritate skin and mucous membranes – not to mention seep into the ground and local water supply through improperly managed sewage systems. Plus, the toxins hang in the air and can permeate your food and stay on surfaces if you go overboard with harsh cleaning supplies. By practicing a few smart, eco-friendly cleaning habits, your kitchen can be toxin-free and sparkling like new in no time. Plus, to get you in a green cleaning mood, Method is offering a sweepstakes with the chance to win a home organizing consultation and a bucket of their awesome green cleansers. Sure, disinfectant cleaners and antibacterial soaps are great at taking care of tough spills and caked on food, but do you actually know what’s actually in them? Herbicides, fungicides, and pesticides – not exactly something you want to be wiping all over your kitchen. The EPA classifies 275 of the antibacterial agents commonly used in cleaners as pesticides, some of which have been linked to serious health problems. Put it this way: if these chemicals are toxic enough to kill animals and microbes, do you really want to be spraying these concoctions inside your kitchen? A better choice is to opt for all-natural cleaners that are free of harmful chemicals and volatile organic compounds. Method takes pains to ensure that their cleansers and soaps are safe and sustainable. They do not use parabens, phosphates, ammonia, chlorine bleach, and a slew of other chemicals because of their known adverse side effects. You can also mix up your own line of eco-friendly cleaners with common items found in your kitchen, which brings us to our next tip. You can clean just about any surface in your house with a few everyday products: baking soda, white vinegar, lemon juice, salt, and water. Baking soda is a miracle worker: mixed with a little bit of water, it does wonders on counter top spills, stains in the refrigerator, and a dirty tile floor. Add a little lemon juice for a citrusy scent. If your sink is clogged, pour 1/4 cup baking soda down the drain, followed by 1/2 cup of white vinegar. Let it sit for 20 minutes, then flush it with hot water. If grease is the culprit, use 1/2 cup salt and 1/2 cup baking soda and rinse with hot water. For tough spots, like burnt food in the oven, resist the urge to reach for the industrial strength aerosol cleaners. Don’t even think about buying oven cleaner — it’s jam packed with toxic chemicals like lye, ethylene glycol, and methylene chloride that can burn your eyes, skin, and even your organs if you breathe it in. Instead, sprinkle about 1/4 inch of baking soda over the bottom of your oven, making sure that any stains or spills are completely covered. Over the next few hours, spray it with water every so often to keep it moist, then let it sit overnight. In the morning, the grime will easily scrape off with the baking soda. Vinegar also works great as an all-purpose cleaner. It is mildly acidic so it wipes away grease, mildew, and coffee or wine stains. To clean a food covered microwave, place 1/4 cup vinegar and 1 cup water in a glass dish and microwave the mixture for two to three minutes, then let it stand for about 10 more. The steam and acidity will loosen the food particles, allowing them to be easily wiped off. Lemon juice can be used for nearly all the same purposes as vinegar. It’s easy to let dirty dishes pile up, but that’s a surefire way to fill your sink with germs. From used plates and silverware to dirt-filled rags, the sink sees a lot of grimy activity. Plus (if you do eat meat) there is the added concern of salmonella and E-coli from handling raw meat. The best way to eliminate the growth of germs and bacteria is to get in the habit of washing dishes right after you use them. 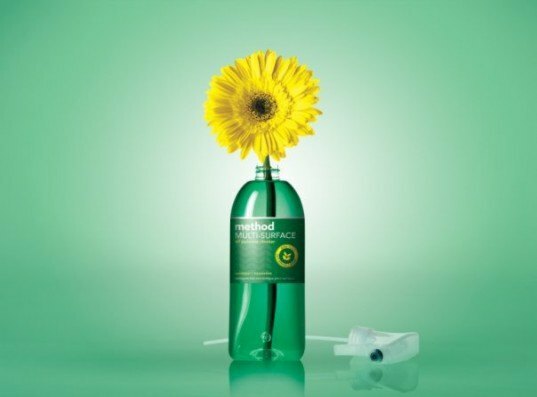 Use a green, biodegradable dish soap like Method’s, and do not let the water run! The average faucet flows at 2 gallons per minute, so you’re wasting a TON of water if you leave it on while scrubbing. Regularly clean the drain (see above for a homemade solution) to flush out food particles. If you are blessed enough to have a dishwasher, rinse your dishes immediately, then place them in the washer. It’s best to run the dishwasher daily to avoid bacteria build up, but you should only run it when it is full or else you’re wasting a lot of water and energy. (For more information on the energy efficiency of hand washing vs. a dishwasher, our friends at Treehugger ran the numbers). Reusable washcloths and sponges are definitely the greener choice for washing your dishes and wiping your counters, but they are hotbeds for germs and bacteria. In fact, the kitchen sponge is the number one source of germs in most houses. 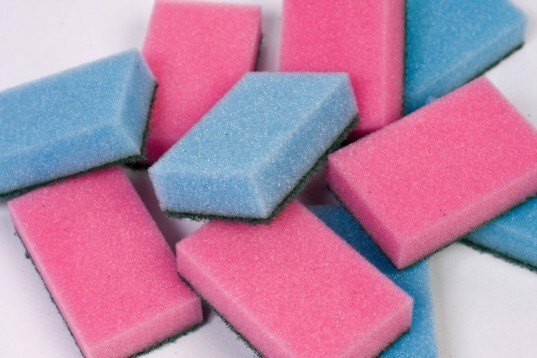 The moist, tiny crevices in a sponge that make it such an effective cleaning device are also perfect little homes for bacteria. Using a damp sponge just spreads germs from one surface to another. To avoid coating your dishes in bacteria, some people suggest soaking your sponge in a bleach and water solution, but that only succeeds in filling it with chemicals. Instead, boil your sponge for three minutes to kill germs between uses. You can also pop it in the microwave for two minutes, or run it through the dishwasher. For washcloths, let them dry completely after each use, as bacteria thrives in a moist environment. Washcloths should also be washed in the laundry machine and replaced at least once a week. For a constantly clean kitchen, take care of messes as they happen. If raw egg gets on the counter, disinfect right away. If spaghetti splatters in the microwave, wipe it clean. If crumbs fall on the floor, sweep them up. Cleaning as you cook might add a couple extra minutes to your meal preparation, but it will save you time in the long run. Instead of spending an hour scrubbing dozens of sticky spots from your fridge every other week, it will only take you a minute to wipe up spilled juice. You should also be aware of expiration dates and clearly mark leftovers with the date they went into the fridge. Throw away old, spoiled food at least every two weeks to avoid mold colonies from taking root. Bacteria multiply at an alarming rate. A single cell can become more than 8 million in less than 24 hours, and just a few can make you sick. By cleaning as messes occur, you’re eliminating the chance for bacteria to grow, but, remember, if you’re using toxic cleaning supplies, you’re simply swapping dangerous bacteria for dangerous chemicals. For the cleanest, safest kitchen, always use all-natural cleansers. Publicado por ekuazion en 11:04:00 a. m.